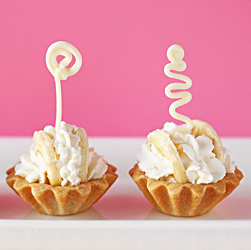 In those posts I suggested several other options for filling the tartlet shells, one of which was banana slices and whipped cream. Sort of a banana cream pie, Lilliputian size. I wanted them to be sort of fancy and whimsical, so I decided to pipe some white chocolate in silly little shapes to enhance them. You may notice that the intricate shapes have a “tongue” piped on the bottom for inserting into whatever you are decorating. First I drew some designs with a pen on the back of some parchment paper. I turned it over and put it on a cookie sheet. I put about an inch of water in a sauce pan and got it simmering and put a stainless steel bowl on top. I put about a cup of Ghirardelli’s white chocolate chips in the bowl and stirred for about 5 minutes until it was melted. I made a piping cone from a 9-inch square, which is a couple of inches bigger than the one used for the bees. 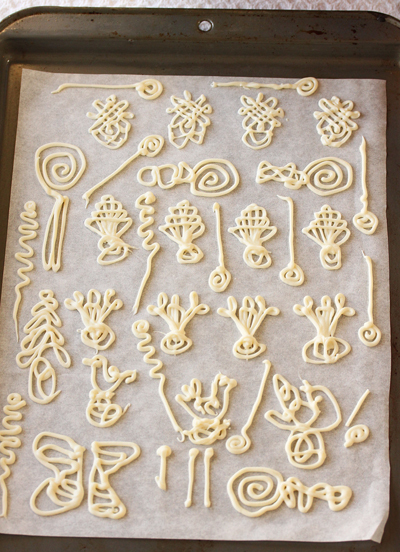 Then I scooped the chocolate into the piping cone, cut off the tiniest point and traced over the penned designs. I still had quite a bit of white chocolate left in the piping cone, so I piped a bunch of free form shapes in between the original ones. The chocolate took about two hours to set, but still wasn’t really hard. It has been about 90 degrees and it was affecting the chocolate. So I put it in the refrigerator to get really hard. Removing the chocolate from the parchment paper was sort of tricky. You have to peel the parchment away from the chocolate, not peel the chocolate away from the parchment. By this I mean, don’t have the parchment flat and try to lift the chocolate off. It will break. Hold the parchment in your hands and slowly peel it away from the chocolate pieces. Keep the gewgaws on the sheet in the refrigerator until you are ready to use them. Next I whipped the cream to stiff peaks with a little sugar and put it in a piping bag with a star tip. I sliced a banana in thin slices and piped some of the cream in the tart shells. The banana slices were inserted in the cream and more whipped cream piped in between. And then the white chocolate gewgaws were inserted into the whipped cream. Voila. So pretty, yet so simple (well, once your tartlets are ready)…and surely delicious. What a great idea for a party. Love the chocolate “gewgaws”. 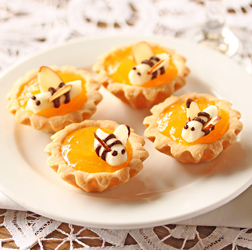 Makes a simple dessert look fit for an elegant occasion! If only I had one ounce of your creativity. So wonderful! These could be served at the very finest dining establishments. They are beautiful (and yet so simple!) I love recipes where my creativity can shine…this looks like a perfect afternoon project. Thank you for sharing Lynne! Lynne, these are darling! I love them and loved that you filled them with banana cream. they looks amazing! you’re so artistic lynne! those white chocolate drawings are awesome! OMGG (Oh My Gew Gawd)! You are a true artist! See? Doesn’t that OCD come in handy? Banana cream pie is one of my faves. Need drool cup now! With a title like that I simply had to read this post!! Love the Gewgaws!!! 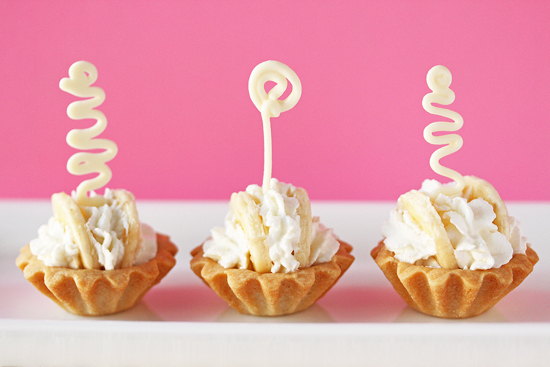 Such an easy and clever way to garnish a dessert! Never would have thought to do long ones – another idea I can’t wait to try! Lynne, you are remarkably creative. So happy you have an outlet to share this creativity with the rest of us! These are so, so whimsical!